Undoubtedly, they still have a talented squad – most of whom were their last campaign when the Red Devils won the title – but they were not a dominant team last year and the only thing that pushed them forward was the management skills of Sir Alex Ferguson. Filling his shoes after such an incredible run off sustained success was always going to be difficult for David Moyes, but nobody ever thought that with so many great players at his disposal he would be doing so badly. What makes the situation look worse for the former Everton boss is how well his old team are doing under their new manager, Roberto Martinez, as Everton remain the only unbeaten side in the Premiership and their 3-2 win over Newcastle on Monday night saw them move up to fourth in the table. 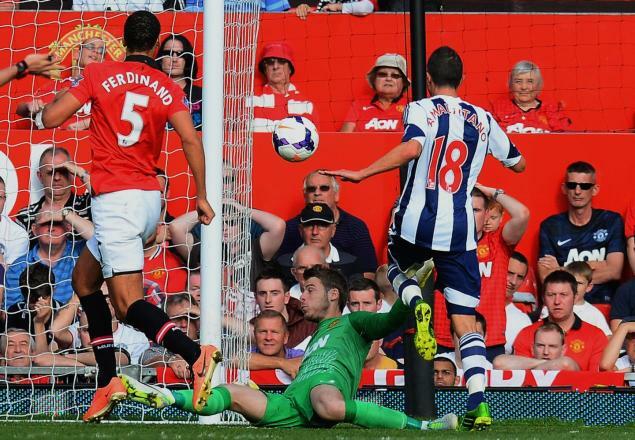 Many people have compared the slow start under Moyes to the one that Ferguson made back in 1986 and it is true that just over three years into his reign, Sir Alex’s position was under threat until a goal by Mark Robbins gave United a victory against Nottingham Forest in the FA Cup, a competition they would go onto win to begin the generation of trophy gathering. Nevertheless, this a different era now and it is unlikely that the Glazer family will stand by a manager for any length of time if it appears that it will cost them the riches that come from qualifying for the Champions League every year, after all, they are in this for money, not love. By contrast, the defeat for Manchester City on Saturday – 3-2 away at Aston Villa – was not a matter of Manuel Pelligrini’s side being outplayed, rather that the home side took their chances and capitalized on the Sky Blues’ profligacy in front of goal. City had broken the deadlock just before half-time through their top scorer this season, Yaya Toure, but Villa equalized after the break with a goal from Karem El Ahmadi, although the Dutchman was offside when the ball was passed to him. Pelligrini’s men regained the lead thanks to a header by Eden Dzeko, but a free-kick by Leandro Bacuna and a break-away goal from Andreas Weimann sealed the win for Aston Villa, who were without their main striker, Christian Benteke and who now sit in the top-half of the table, despite having played three of the teams who finished in the top four of the Premiership last season in their opening six matches. Although their performance was not necessarily something that will have concerned Pelligirini, what will be a worry for him is that City have managed to pick up only a solitary point from their first three games away from the Etihad this campaign and, if they cannot turn around their form on their travels, then claiming a second title in three seasons will be beyond them. They already trail the leaders, Arsenal, by five points after the Gunners picked up their fifth consecutive league victory – their ninth in a row in all competitions and their 12th on the trot away from home – by beating Swansea 2-1 in south Wales. Arsene Wenger’s side now sit two points clear at the top of the table after Tottenham dropped back from the pace a little with a 1-1 draw at home against Chelsea. For the opening thirty minutes, it appeared as though Spurs were going to coast to an easy win, as they dominated the game and had taken the lead when Christian Eriksen played a ball into Roberto Soldado, who laid the ball off nicely for Gylfi Sigurdsson inside the area and the Icelandic midfielder provided the finish for his third goal of the season. However, Chelsea came back into the match after half an hour and Jose Mourinho’s tactical changes at the break – which included moving Eden Hazard into the central number 10 position, bringing on Juan Mata, and moving Oscar to the right-wing – worked a treat as the Blues dominated the second period. They got their reward with a John Terry header from a Mata free-kick and they looked likely the only team who might win it, until Fernando Torres was sent off with just under ten minutes to play. After the match, Mourinho criticized Jan Vertonghen for having got Torres sent off and described the Belgian as acting disgracefully, as well as suggesting that without the red card, his team would have gone on to take all three points. Even as an ardent Tottenham supporter, I have to say that the Portuguese manager – who begrudgingly shook hands with his former friend and assistant, Andre Villas-Boas, before the match – was absolutely correct in his view of what happened, although he did fail to mention that his Spanish striker should have been dismissed earlier in the game for scratching Vertonghen’s face. However, the Belgian was in the wrong with pretending to have been caught by an elbow and I have raised this point before about the Spurs central defender – that he can become more embroiled in a personal battle with an opposition player, rather than focusing on his primary job of helping the team win the game. 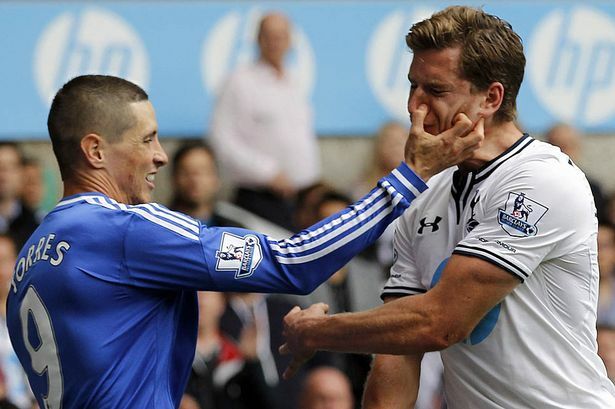 Against West Brom last season, Vertonghen was involved in a wrestling match with Jonas Olsson and thus failed to provide cover while Albion equalized, costing Spurs two points, and in the Chelsea game, he had an ongoing confrontation with Torres that was always going to end up with one of them being sent off. Although the Spaniard did lead with his elbow and the booking may have been justifiable anyway, it was playacting from Vertonghen and I hate to see any Tottenham player resort to such underhand tactics. The same can be said of Andros Townsend, who continued his quest to be the club’s replacement for Gareth Bale when, for the second time this season, he was booked for a blatant dive – this time in the middle of the pitch when it really did not gain him any advantage. Although Townsend provides some energy on the right-flank and his performances thus far have been solid, he is far too quick to shoot from distance – perhaps thinking he really is the new Bale – and it breaks up so many attacks that I think Spurs would be better off playing their record signing, Erik Lamela in that position. A Liverpool striker scored with his arm last weekend, but this time it was not Luis Suarez – who played his first Premiership match of the season following a ten game suspension for biting – but Daniel Sturridge who was the subject of the controversial goal. Nevertheless, Suarez did get on the scoresheet twice – on both occasions being setup by his strike partner, Sturridge – and Liverpool moved into second place with a 3-1 win away at bottom club Sunderland, who mounted a comeback in the second half, but could not find the equalizer after Emanuele Giaccherini had given them some hope. Elsewhere, Hull beat West Ham 1-0 to extend the Hammers winless run in the league to five games, dating back to the opening day of the season; the pressure piled on Martin Jol, as his Fulham side lost 2-1 at home to Cardiff; but the Dutchman’s former assistant at Spurs, Chris Hughton, secured his position for at least another couple of weeks as Norwich won 1-0 at Stoke; and Southampton had a routine 2-0 victory over Crystal Palace to move into sixth place in the table. This week, there are Champions League and Europa League fixtures, then a final round of Premiership matches before another break for World Cup 2014 qualification games. On Tuesday, Arsenal made it 10 wins in a row with a 2-0 defeat of Napoli at the Emirates; Celtic lost 1-0 at home to Barcelona, with the visitors enjoying an amazing 82% of the possession; while Chelsea secured a 4-0 victory away against Steau Bucharest. Wednesday sees Manchester City host the reigning European Champions, Bayern München, and Manchester United travel to the Ukraine where they will face Shaktar Donetsk. In the Europa League, Tottenham have a trip to Russia – but thankfully Moscow, not Dagestan – where they will play Anzhi Makhachkala and they will have the opportunity to thank their hosts for not selling them Willian; Swansea play FC St Gallen of Switzerland; and Wigan entertain the Slovenian side Maribor, who played Spurs in last season’s competition. At the weekend, West Ham are at White Hart Lane to take on third place Tottenham; Liverpool have a home banker against Crystal Palace; West Brom will try to end Arsenal’s run of victories when the two sides meet at the Hawthorns; and Manchester United have a great chance to get back on track as they play the bottom side, Sunderland, at the Stadium of Light. With the international break coming up, Martin Jol might find himself out of a job if Fulham do not get a positive results against Stoke at Craven Cottage; Hull entertain Aston Villa; Chelsea travel to Norwich; Everton’s unbeaten start goes up against Manchester City’s 100% home record; and two passing sides meet at St. Mary’s, as Southampton face Swansea.